God of Vengeance: A gripping, bloodthirsty Viking saga! The first of a series, God of Vengeance takes place in Norway in 785 AD. The story begins with the betrayal of a lord by his king. An ambitious King Gorm betrays his oath-sworn warlord, Jarl Harald, and puts his family to the sword. However Gorm makes one fatal mistake … he does not kill Harald’s youngest son, Sigurd. With his kin slain, his village seized, and its people taken as slaves, Sigurd wonders if the gods have forsaken him. In addition, he is now hunted by powerful men, and Sigurd has only a small band of loyal followers at his side. However, with them and with the help of the All-Father, Odin, Sigurd will make King Gorm pay with his life for his treachery. Slowly, Sigurd gathers together a band of loyal and battle-tested warriors; a band that includes his father’s right-hand man Olaf, Bram (a bear of a man), Black Floki who wields death with any blade, and the fierce shieldmaiden. Valgerd, a warrior who fears no man on earth. Whether Ódin is with him or not, Sigurd will have his vengeance. And, neither man … nor the gods … will stand in his way. Accurate Viking Lore, Culture, and Warfare! God of Vengeance is a good Viking tale. 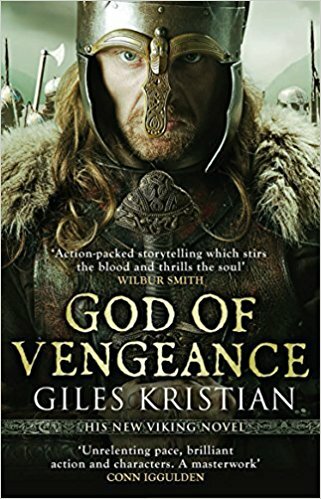 Giles Kristian has a great understanding of Viking history, culture, religion, language, and warfare. He manages to convey it all in a compelling if somewhat predictable, story. As a result, there is a great deal of authenticity in this book and Viking fans will love it. Kristian captures the Norsemen’s fatalistic sense of humor perfectly and the dialogue is very good. I enjoyed the comradery and how the characters were constantly quipping, insulting each other and egging each other on. That tradition is very much alive in the true warrior branches of the U.S. military today. The reader will really get to know most of Sigurd’s crew and will be vested in their respective fates. God of Vengeance is a must-read for all who enjoy thrilling, action-packed fiction in the manner of Bernard Cornwell or George R R Martin. Previous PostGreat Post by GP Cox on Pacific Paratrooper!Next PostDoes Your Writing Need to Lose Weight?